The PCI standard requires that plug-in boards use a +3.3 V power source provided by the PC's motherboard, making the +5 power obsolete. In response to this development, Contemporary Controls introduced a universal-voltage PCI ARCNET Network Interface Module (NIM) which is compatible with both +3.3 Volt and older, 5-Volt computers. The PCI20U product is a drop-in replacement for the PCI20, +5 V PCI card which removes any work needed by the user to migrate to +3.3 V PCI or PCI-X slot motherboards. This demonstrates the company's commitment to ARCNET technology and to their customers' requirements for legacy installations. 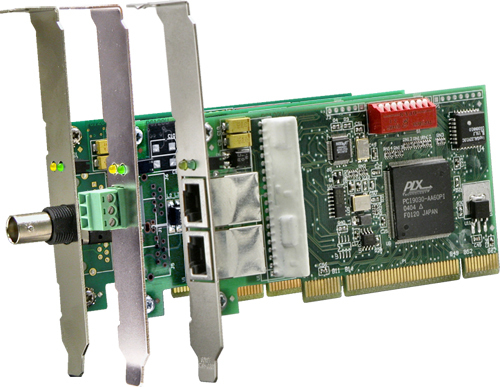 PCI-X is an enhancement to the original PCI Local Bus Specification enabling devices to operate at speeds up to 133 MHz. If a PCI20U is installed into a bus capable of PCI-X operation, the clock remains at the 33 MHz frequency-restricting all other devices on that bus to the conventional PCI protocol. This device incorporates the COM20022 chip. New features include command chaining, sequential access to internal LAN, and duplicate node ID detection. Bus contention problems are minimized since the module's interrupt level and I/O base address are assigned through Plug-and-Play (PnP) operation. There is no requirement for wait-state arbitration. The PCI20U Series exploits the new features of the COM20022 such as 10 Mbps communications utilizing the various EIA-485 transceiver options. This includes DC-coupled and AC-coupled (transformer) EIA-485 variants. Conventional 2.5 Mbps dipulse signaling is also supported. The PCI20U module has two LEDs on the board for monitoring network operation and PCI bus access to the module. It is equipped with an 8-position, general-purpose DIP switch which could be used to reassign the ARCNET node address without removing the module. Ultimately, the node address is configured via software so the DIP switch can be used for user-defined functions.